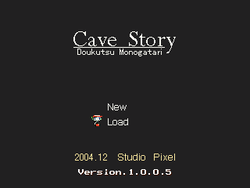 Cave Story (洞窟物語, Dōkutsu Monogatari?) is a freeware action-adventure video game released in 2004 for the PC, designed and created over five years by Daisuke Amaya, art-name Pixel. It has been translated to English by Aeon Genesis. Nicalis, an independent video game company, worked with Daisuke Amaya to bring the game to Nintendo's WiiWare service. The updated re-release was released on March 22, 2010 in North America. Later that year, it was also released as a downloadable game on the DSi platform. It has also been released on the Nintendo 3DS as Cave Story 3D, that included a few extra stages put between other stages. Later, it was released on Steam as the name Cave Story+, which included a 'modding' system that allowed bonus challenges to easily be implemented into the game by fans and Nicalis themselves - currently, along with the Boss Attack, Curly Story and Sanctuary Time Attack modes from earlier rereleases, it includes the brand-new levels Wind Fortress and Nemesis Challenge, both time attacks themselves. Also included is a Christmas tileset available if you play the game on December 25th. The main character awakens in an underground cavern with no memory of how he came to be there. He finds a village populated by rabbit-like creatures called Mimigas, who are being persecuted by the Doctor. Two of the Doctor's servants, Misery and Balrog, are looking for a Mimiga named Sue, but mistakenly abduct a Mimiga named Toroko. The player's main quest is to rescue Sue, save the Mimigas from the Doctor, and escape the floating island on which the game is set. There are three different endings: a good ending (naturally the hardest to get, involving a very difficult final stage and two extra bosses, including a multi-phase final boss), a normal ending, and a bad ending (which occurs about halfway through the game and requires little effort to get). The endings are based on the player finding various secret items. This page was last edited on 24 June 2017, at 06:46. This page has been accessed 88,731 times.